Samsung on Thursday revealed its latest flagship smartphone, the Galaxy S4, with features like photos with sound from a 13MP rear-facing camera, language translation, group media streaming, infrared gesture control and more. With the newest Galaxy S4 debut, Samsung spared no expense as it introduced the device on stage at Radio City Music Hall in New York, complete with live orchestra and an incredibly polished scripted presentation. One of the few major hardware features Samsung introduced was the S4's cameras. A dual-camera mode can capture images from both the 13MP rear-facing and 2MP front-facing cameras, allowing the photographer to be in the video or photograph. Users can also add audio to still photos, along with other advanced software functions. The 5-inch, 441 pixel-per-inch Super AMOLED display on the S4 includes "Air Gesture" capabilities that allows users to interact with the screen without actually touching it. Rounding out the new component set is a plastic body measuring 5.3 inches long by 2.7 inches wide and 7.9mm thick. The S4 runs Android 4.2.2 Jelly Bean on a 1.9GHz quad-core or 1.6GHz octa-core processor and comes with 16GB of storage standard, with options for 32GB or 64GB, while all models come with a MicroSD slot. Powering the device is a 2,600mAh battery. Overall, it seems that Samsung is banking on software improvements and innovations to drive sales, as hardware enhancements were largely iterative. Media coverage of the event has been unusually high for a Samsung product debut, possibly due to pundits sounding off on a "doom and gloom" scenario for Apple, the Korean company's biggest rival in the smartphone space. Whatever the reason, the tech giant was able to drum up a substantial amount of attention. 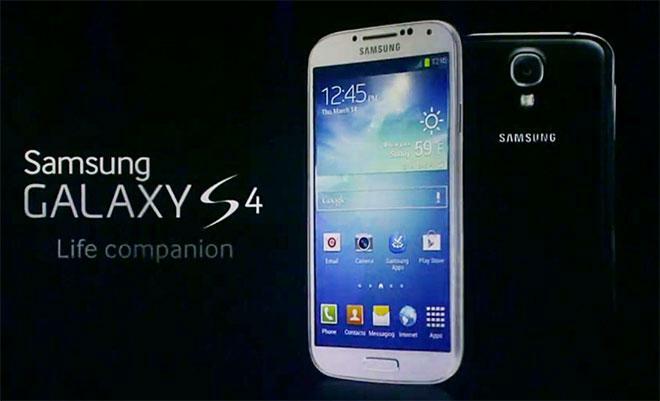 The company's YouTube live Webcast of the S4 unveiling hit over 430,000 viewers when the device was finally unveiled. It was reported on Wednesday that Samsung has substantially boosted its U.S. advertising budget for the company's mobile phone lineup, spending in excess of $401 million during 2012, up from $78 million the year prior. The Korean firm managed to outspend Apple, which consistently generates media buzz when it announces a new product. The battle for smartphone supremacy has become a two horse race between Apple and Samsung. According to a recent report from research firm Canalys, the two companies accounted for a respective 22.1 percent and 29 percent of all global handset shipments for the fourth quarter of 2012. It should be noted that the estimates are based on shipments, not sales. On a device by device level, impressions across Chitika's ad network in North America found Apple's iPhone 5 and Samsung's Galaxy S III to be in a dead heat during the first nine days of February. A broader look at the data showed all Samsung smartphones to account for 20.6 percent of the market, while all iPhone models took a 41.5 percent share. Overall, Apple's marketshare dropped 4.5 percent since the last Chitika study as Samsung's grew by 3.6 percent. As for the new Galaxy S4, the handset will no doubt be compared to Apple's own flagship iPhone 5, which debuted six months ago in September 2012.